'Extreme Cream' (Tom Burseen, R. 2015) Seedling 12-1860A. TB, 34" (86 cm), Early to midseason bloom. 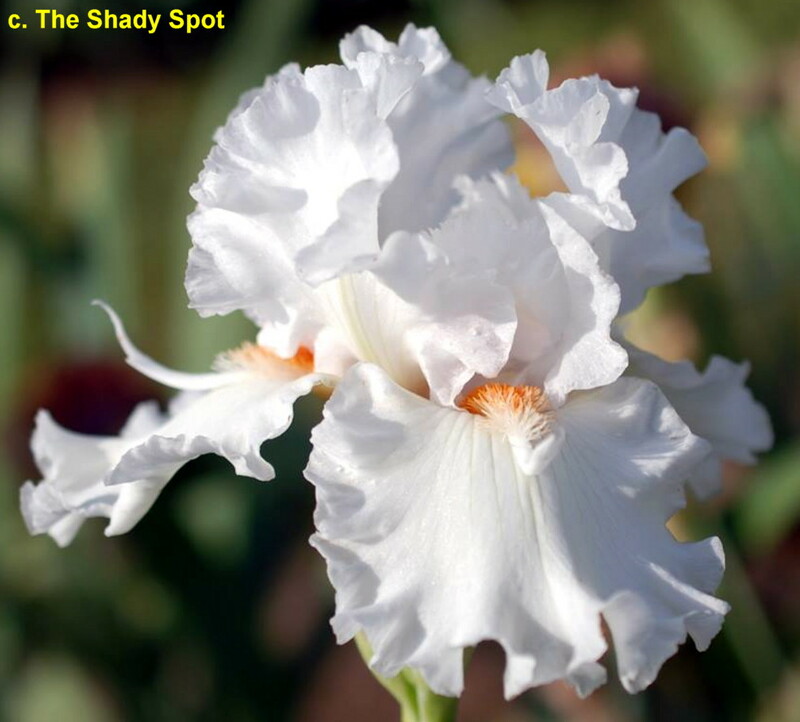 Standards and style arms very pale lilac (RHS 76D); Falls creamy white, olive shoulders, textured veins around beards; beards mandarin red (40B), white and blue tattered horns, big and wide; ruffled; slight musky fragrance. Seedling 10-112: (seedling 08-123: (seedling 06-170: (seedling 03-1: ('Awesome Alex' x seedling 01-129, see 'Hunkin Down' pod parent) x seedling 03-23: (seedling 00-27: (seedling 97-1128, 'Stand In Awe' pollen parent, x seedling 97-323, see 'Awful Purdy') x seedling 00-30: (seedling 97-862: (seedling 94-31: (seedling 90-149: (seedling 88-451: (seedling 86-17: (seedling 84-32: ('Holiday Spain' x 'Porta Villa') x 'Mandolin') x seedling 86-54: ('Lady Friend' x 'Harlem Hussy')) x 'Call Ripley’s') x 'Citoyen') x 'Holy Cow') x 'Abdul Unknown'))) x seedling 06-6: (seedling 04-326: (seedling 01-41, 'Kid Power' pollen parent, x seedling 02-77: ('Bingo Bango Bongo' x 'Abdul Unknown')) x seedling 04-550: (seedling 02-84: ('Classy Claire' x seedling 99-473, 'Fifty Is Nifty' pod parent) x seedling 01-97: (seedling 99-736: ('Gnus Flash' x seedling 97-341C, see 'Western Ways') x seedling 99-403, see 'Fitobetied')))) x 'Caribbean Cruise') X 'Miles Keith'. Burseen 2016.